Hey everybody! I hope I don’t break my NDA by releasing this (just kidding, this is all planned). I’ve actually been sitting on my hands for a few days waiting to share this. KAMMOK sent me a surprise package this weekend and I did a quick reveal video to show my hands-on look at their new hammock: the Mantis and Mantis UL. 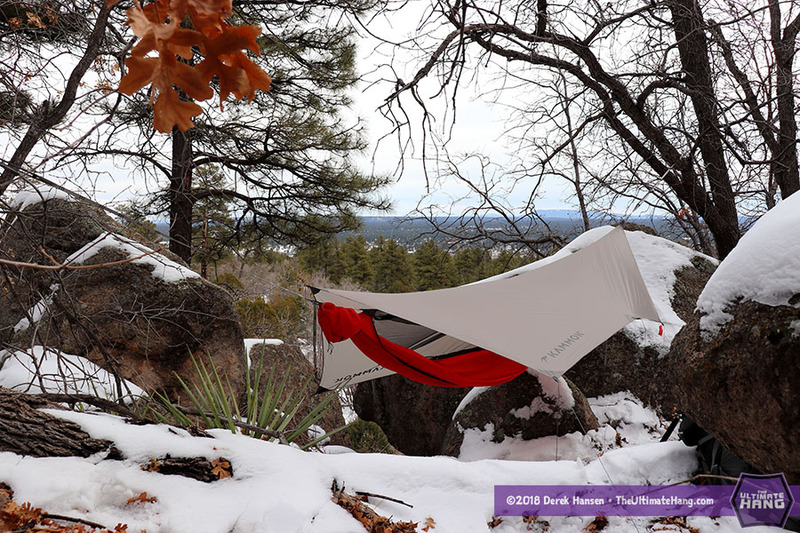 This effectively puts KAMMOK squarely into the all-in-one hammock camping category with a very competitive product. Get all the specs on their Kickstarter page. Just to level set, I wanted to throw in a quick comparison chart to show where the Mantis UL aligns with some of the competition. Please note that this is a short list of all-in-one, or all-inclusive jungle hammocks that include hammock, bug net, tarp, tie-outs, suspension, and maybe stakes. I’ve tried to normalize the comparison by using a hex tarp for all three (Hennessy includes a smaller, asym tarp by default). *Hennessy lists the component weights separately. This total includes adding hammock, sil-nylon hex tarp, and straps. No stakes included. **The Clark TX 270 doesn’t include a tarp, so I added the default XL to the weight and price. No stakes included. No stakes included. Dimensions of the tarp? Dimensions of the hammock? If you gave them in the video, I missed it, and I’ve searched the Kickstarter page you linked to and don’t see dimensions for either anywhere. They give weight and packed dimensions, but not deployed. I’d like to know the size of both the hammock and the tarp, length and width. That’s the only way to fairly compare to existing products. Thanks. Great question. I was hoping Kammok would include it on their Kickstarter page. The hammock I received was a pre-production prototype, so what I list here is subject to change. The hammock measures at 10 feet long. The tarp has an 11-foot ridgeline and is 3 feet at the center point. The panels are longer on one end as there are catenary curves outward. Gotta have a sleeve on bottom that fits a mattress for me. For some reason that always works best my needs. I like your 2-camera setup on the video. I’ve used that technique several times on my cooking videos. Also, the matter-of-fact/informal style you used was great, like it! Thanks Kurt! Just trying something new, and trying to get back into having “fun” with the hobby. In comparison to the asymmetrical design of the Hennessy hammock how does it compare in comfort? Just to clarify, the Hennessy hammock body is just as rectangular as any hammock. It’s the tie-outs and bug net that are asymmetric, which indicates the diagonal lay position. In that regard, the Mantis can be configured similarly with its pull outs but the foot pull out is in he right place for the mantis (Hennessy design is strictly asymmetrical, which puts the foot side pull out near the knee and puts more strain in the feet and legs). I think I’ll always have a place in my heart for Hennessy but it is an acquired taste. The hammock is small in comparison to the Mantis and the netting will feel more roomy. I think the Mantis is more comfortable in both leg hyperextension (a common issue wig Hennessy) and also head room with he bug net. Thanks for the quick and detailed reply it helped me to decide on getting the Mantis. I had a Hennessy which I liked for comfort but the weight of the model that I had and the fact that you cant completely remove the bug netting where issues for me.